The American woman Sheila Wayne has lived in Switzerland most of her life, and she has met a nice young man, Philip, and married him. After the whirlwind romance, she has started to have nightmares about an old haunted house. It seems as though she has had some problems with the same dream before and has been committed to an insane asylum for quite some time. Now that Philip has entered her life the nightmares start to occur again and she is getting more and more troubled by them. 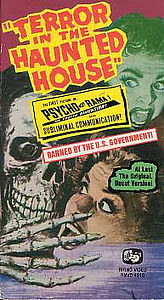 She goes to a psychiatrist and tells him about her nightmare, and she is sure she is going to die in the haunt ed house. Her psychiatrist encourages her to go with Philip and live in America, to get a change in scenery. Sheila thinks it’s a good idea to go back to her native country and she and Philip is on the first plane to the states. But on the plane trip Philip is getting secretive and strange and doesn’t tell Sheila anything about where their going or where they are going to stay. When they arrive in America, Florida, they rent a car and dri ve deep into the swamps, where their new home is located. But as they pull up to the house, far away from anything resembling civilisation, Sheila discovers to her horror that the house is the very same one as in her nightmare! She reluctantly stays in the house with Philip, who claims its good therapy for her, but it doesn’t take long before her uneasiness in the new house becomes a descent into paranoia, as more and more strange occurrences starts to take place there. A weird caretaker, strange sounds at night and a dark, disturbing mystery only Sheila has the answer to. Will Sheila be able to unlock the terrifying secret, hidden deep inside her own mind before it’s too late? Terror in the Haunted House is a chilling little mystery tale from the late 50s (1958 to be exact) and has some good atmospheric moments. 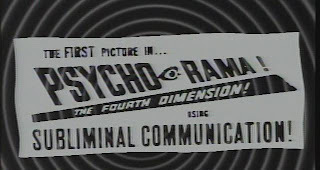 Using a hip, new way to attract audiences, the film is presented in "Psycho-Rama...Using subliminal communication! ", a technique of showing “creepy” and weird looking faces and even messages during the film, so quickly that only your sub-consciousness knows what you’ve seen. A very annoying thing that luckily doesn’t appear to frequently during this little chiller. The story in the film is a mediocre and easily recognizable o ne, but there are some elements in the film that’s exciting in a weird sort of way. The soundtrack is a pretty standard one for 50s horror/mystery films and it gets the job done most of the time. The acting from Sheila (Cathy O’Donnell) and Philip (Gerald Mohr) is ok, and it’s what you’d expect from a movie like this. The main problem with the film is the fact that it doesn’t stand out among the tons and tons of other gimmicky shockers from the 50s, but as far as entertainment value goes, this one delivers what you need when you’re hungry for some old school schlock. So Terror in the Haunted House is a pretty decent little terror tale that’ll serve nicely as a weird dish if you want to see a trashy old horror/mystery film in the middle of the night.